This spicy green bean recipe is taken from Madhur Jaffrey's Far Eastern Cookery book. She says in her cookbook that she got this recipe from a "long-toothed lady with a food stall ensconced right in the middle of the Weekend Market in Bangkok." We make this colorful and spicy dish when we're in the mood for something with a bit of heat. We would highly recommend you get fish sauce for this recipe, it smells horrible but really adds to the flavor of this dish. You should be able to find it in your local grocery store. Also, have all the vegetables prepped and ready to go before you start. You'll want to be able to pay close attention to the food as it cooks. You can always add more chilies if you want the dish hotter, put in fewer to lessen the heat. Another way to lessen the heat is to de-seed the chilies before you slice them. Ms. Jaffrey says if you like you can throw in a small amount of finely diced red bell pepper in the last five minutes of cooking, just for color. (we've never done this). If you have never tried cooking in a wok you should. It will open up a whole new world of cooking and flavors for you. 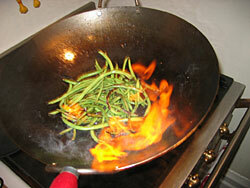 Put oil into a wok and place over medium-high heat. When the oil is hot add the garlic and chilies. Stir and cook until the garlic turns golden. Add the pork, breaking up any lumps and cook until the pork has lost it's raw look. Put in the green beans, paprika, brown sugar, fish sauce and 1 1/4 cups water. Cook, stirring on medium-high heat 8-10 minutes or until the beans are tender and most of the water has been absorbed.